With the cold now here and even colder days sure to come, I thought it'd be fun to put together a small collection of different outerwear pairings. Because keeping yourself from freezing can still be cute. 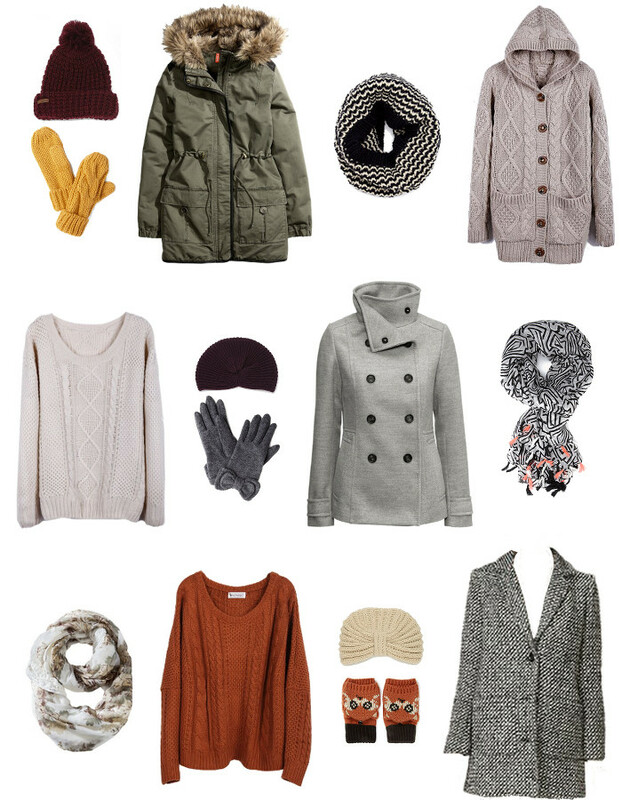 There are several reasons why this is my favorite time of year and the fact that it involves the cutest season for clothes (in my opinion) is definitely one of them. The holidays, snow, and no allergies or sunburns also make that list for obvious reasons. I am in the market for some chunkier, super warm sweaters and other cold weather gear. While browsing sweaters, I remembered the sad state of the one pair of mittens I own. So I began browsing for a pair of gloves too. Needless to say, I ended up browsing a lot and came up with quite a wishlist. You can also read that as I have a birthday coming up in a month (and Christmas shortly after, of course) and I'm trying to come up with things to ask for. I love putting together outfits, instead the common wishlist of random things, so you get this. You're welcome. Also, I'm pretty sure everyone needs a pair of fox mittens in their lives, right?